I had been yearning to try Mediterranean restaurant, Fig & Olive for quite some time now so I jumped at the chance to dine at Fig & Olive for lunch during Restaurant Week. 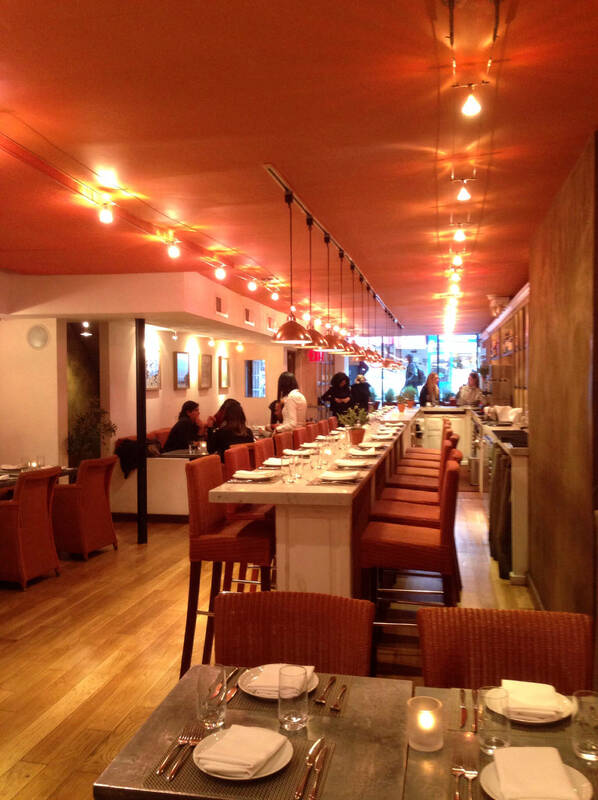 My friend and I ate at the Uptown location, which was beautiful, sleek, elegant and cozy with comfortable seating, which had an intimate feel. 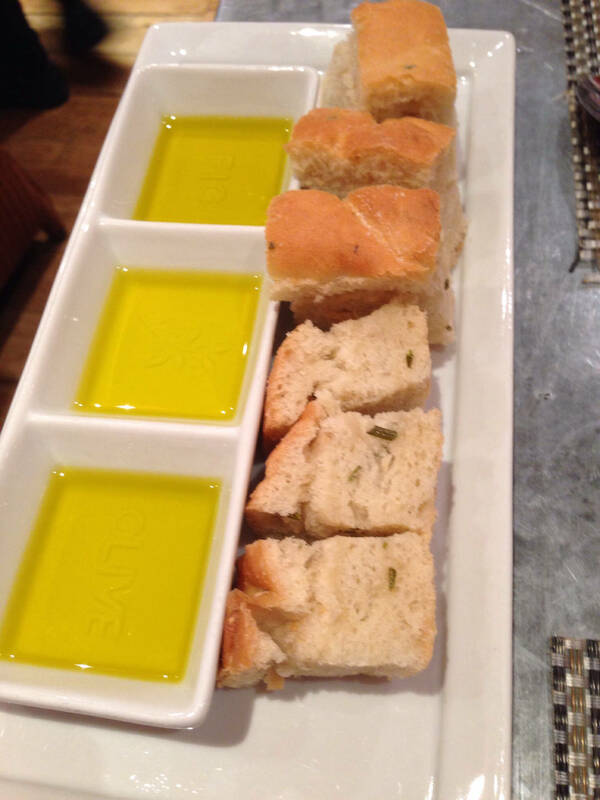 After we settled in, we were served a plate of rosemary focaccia bread pieces and three different types of olive oil: Two from Spain and one from Italy. The bread was mediocre, a little bit dry but the olive oil was rich and tasty. 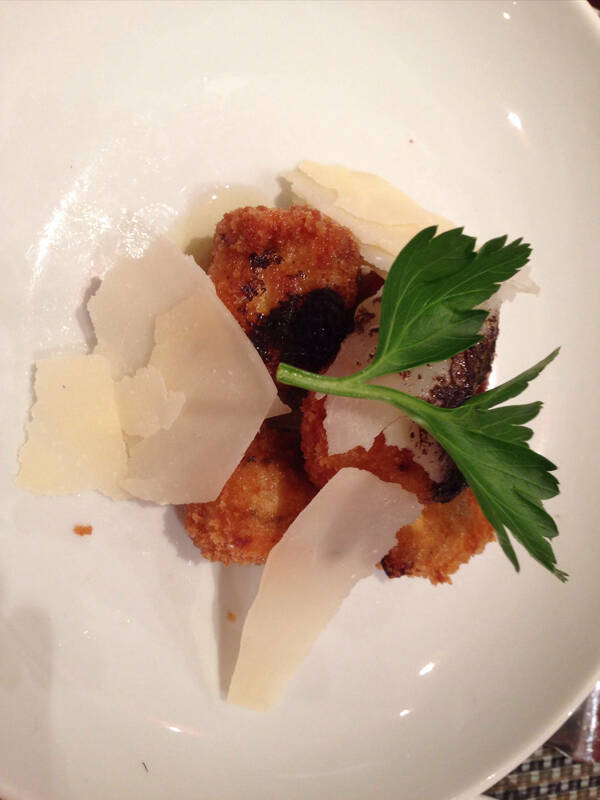 For my appetizer, I chose the truffle mushroom croquettes, which were delicious fried balls of cremini mushroom parmesan and béchamel, served with truffle oil aioli. They were incredibly flavorful, fresh and wonderful! The main course was Rosemary Lamb, which consisted of grilled lamb and red bell pepper on skewers with rosemary ends, a fig and cous cous with red onion, scallions and tomatoes, and sauce made out of Greek yogurt base. The lamb was amazing… Perfectly cooked, tender, well-seasoned and incredibly appetizing. The cous cous was also quite good, and I normally don’t like cous cous that much. I enjoyed both the lamb and cous cous with the sauce, giving the dish more depth. There were only two options for dessert, so my friend and I ordered one of each so that we could try both. 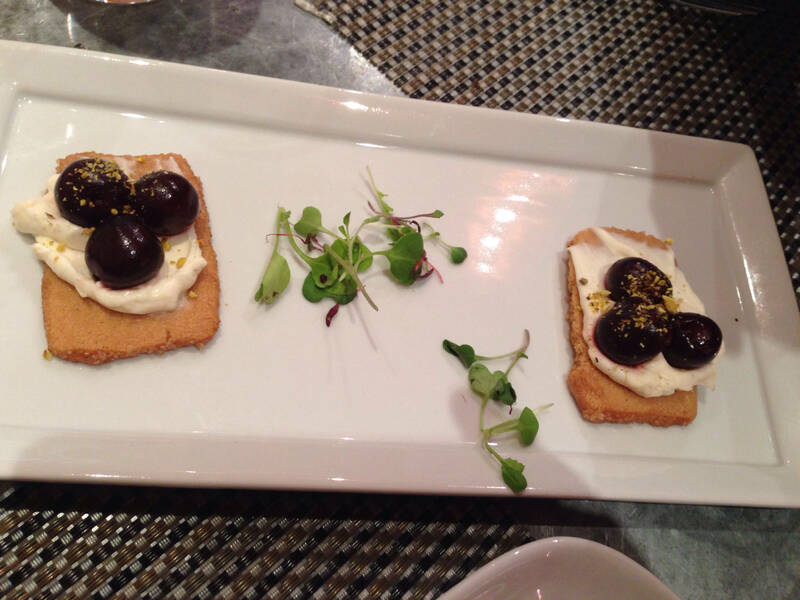 The “Dessert Crostini” was Amarena cherry and mascarpone on top of pistachio shortbread with basil. There were two of these so it was perfect and I liked the taste of mascarpone on the shortbread but I thought the cherries were way too sweet. 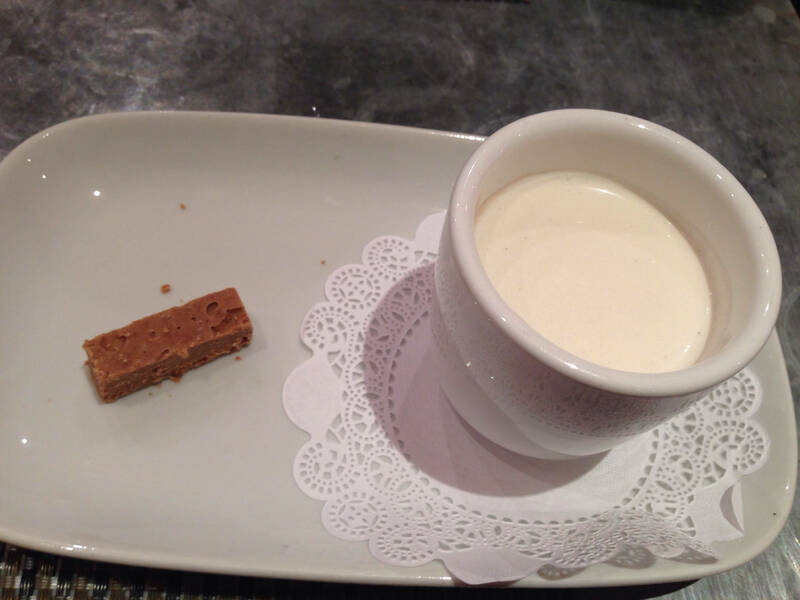 The chocolate pot de crème, which came with a crunchy praline financier (basically a fancy Kit Kat bar) and vanilla cream on top, was out of this world delectable. It was incredibly chocolate-y and had a lovely smooth consistency with just the right amount of sweetness. 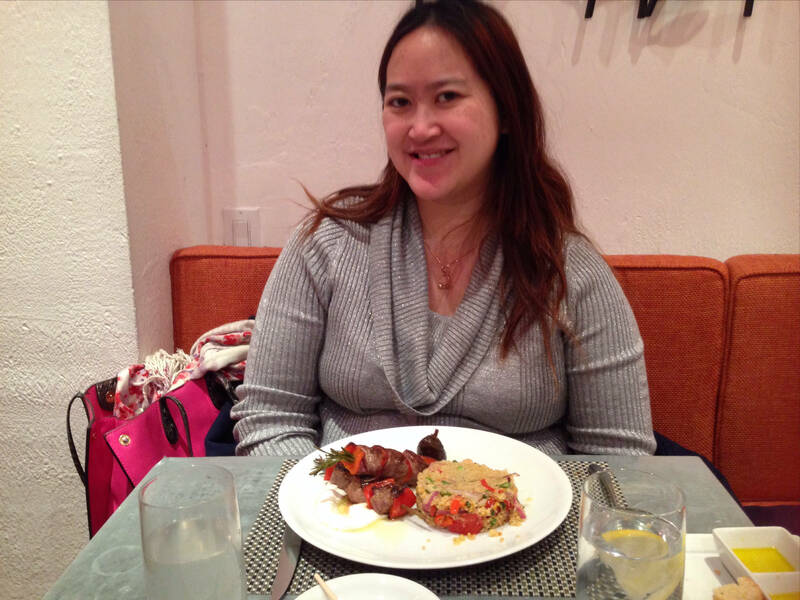 I really enjoyed my meal at Fig & Olive. The service was also high quality. I would highly recommend trying out this restaurant!